One afternoon in 2008, while walking my dog Holly in our small woodland I realised that my living in a small conifer plantation in South Carlow, in the South East of Ireland, had significant potential to be examined as a site to explore sustainable forest methods that were new to Ireland. It would also enable me to extend and share ideas about the importance of art-land-ecology practices. I have since created an open-ended, art-forest project within and with the forest, and with foresters, the local community and politicians, that is revealing new understandings in contemporary transversal practices, ecological science and forest policy. This transversal project draws on skills, interests and contacts that I had developed from working in different areas in my working career; biological science, visual culture, experimental film-making, forestry, Green politics, web design and social media. While I had some general forest knowledge before I began the project (I have long associations with Crann and ProSilva Ireland Irish forest organisations over these past 19 years since coming to Ireland from New Zealand in 1996) I was keen to think my way through ecological concerns in a very practical way through exploring contemporary eco art practices. I knew from my science background that practicing new forestry might lead to new information relevant to a certain location but I also sensed that an eco-art practice might develop even richer understandings and engage audiences far beyond forestry circles. Therefore I didn’t confine the project to specific outcomes as I would have with my previous scientific research. Instead I made a commitment to relate to the forest in which I live as ecologically as I could, starting from general environmental interests and my long interest in eco art practices. The forest-in-the-making became Hollywood, named after our dog Holly and refers to the experimental films I make about this project. At the beginning I didn’t have any practical forest managements skills so that was daunting (I will never be able to operate a chainsaw for instance) but I had maintained connections with leading foresters over the years as I have long given web support and helped create forest publications for Crann and ProSilva Ireland. Following advice from Jan Alexander, founder of Crann and then Chair of ProSilva Ireland, and RDS (Royal Dublin Society) Forest Award recipient, from 2008 onwards I attended specific forest study days in Ireland and study tours to Europe (to Slovenia, Hungary, The Netherlands) on new-to-Ireland, ‘Close-to-Nature’ Continuous Cover (non-clearfell) forest management methods. Jan Alexander and the committee of ProSilva Ireland (the lead NGO on the new ‘Close-to-Nature’, Continuous Cover forest management modelt since 2000) and foresters in ProSilva Europe, particularly Prof. Jurij Diaci (Slovenia) and Phil Mogan (Chair of ProSilva CCFG, UK) have been very interested and supportive. That this project was to later produce new understandings not only in my creative practice, but also in forest science, ecojurisprudence (eco-law) and progressive forest policy has been very unexpected as was finding myself in the last year as the Forest Policy spokesperson for the Irish Green Party. This is somehow due to the commitment I’ve given my forest ‘neighbours’. For me, the project has launched a series of ongoing questions and has somehow made me feel responsible to take actions for the forest I live with and my web skills allows me to share the story of Hollywood and the new understandings the work is leading to. By taking actions that safeguard the long term future of my forest (I see this as a 40 year+ art residency) has meant that some of my actions, for instance my work in successfully arguing for new ‘Close-to-Nature’ Continuous Cover forest methods as the key point in new Irish Green forest policy, helps my forest and perhaps in time, Ireland’s forests overall. Questions keep coming, ecological concerns keep arising (such as the recent Ash die-back disease) yet the commitment is getting stronger. For instance, I am increasingly interested in laws that are developing overseas to prevent ecocide that would extend a legal duty of care to our environments; I’ve been particularly excited that a major river in NZ that has connections to my family, was given legal standing last year. At its heart, this project asks how do we relate with more ecological wisdom to our forests, how can we move away from industrial monoculture, clearfell forestry methods that are not viable in the long term. I think approaching these questions from many perspectives deepens our ideas of the work involved in long term sustainability for any bioregion; i.e., this is an example of an ecosophy that has arise from deep relations to one place. I have studied long-term eco art projects at the National College of Art & Design, Dublin, since the late 1990s. I was taught for two years by a Joseph Beuys scholar, Dr Mia Lerm-Hayes (Beuys was a German artist, educator and one of the founding members of the German Green Party). I had a particular interest too in the work of American artists, Helen and Newton Harrison, who initiated the first and continue to undertake extensive eco art – land-policy projects since the early 1970s across the world. My earlier background in research biology means I’m familiar with the language of science and the implementation of longitudinal biological studies. So when I began this project I had a loose framework of ideas from these leading artists and my previous work background. However, its taken time to articulate my long-term goals. Particularly as I find that understandings of the small field of eco art practices is so little understood in the art world, let alone by the general public. For instance I didn’t dare tell many foresters that I was creating an art project to begin with and it is a curiosity to my political colleagues. I just made a start by learning and transforming my forest with leading professional foresters who are leading new practices of “Close-to-Nature” forestry in Ireland. As the project has progressed I’ve been surprised myself that this plural perspective methodology can also deliver such diverse new understandings. The forest transformation began in May 2008 when I invited Jan Alexander to give a hands-on workshop of ‘tree-marking’ to myself, my husband and people interested in more sustainable forestry in my community, in South Carlow, Ireland. I also invited local Green Party Councillor Malcolm Noonan and he and former Minister Mary White have had an interest in the project from that time (I had worked intensively in local Green politics from 2004-7 and in Green Forest Policy from 2010-12). allows the forest to remain (the opposite of industrial forestry that employs clear-felling/clear-cutting) and creates gaps for young tree seedling to naturally regenerate. In our case, as the site is small and bounded by hedgerows of native trees, an army of small native Ash trees marched in with some other native species, very quickly after the first thinning. They are growing faster now since the forest has been thinned. the first thinning when approximately 25% of the trees were removed. It was thinned a second time in January 2013 and forest is now producing roughly 70 tonnes of wood over a three year period and growing even faster – the older conifers create a stable, wind shelter and micro-climate for the young trees. We have areas in our forest where Ash and other native trees are at different heights; some Ash that appeared after the first thinning are now waist to shoulder height. The flora and fauna are changing all the time and becoming diverse too as the forest community changes. In 2010 I returned to the National College of Art & Design in Dublin and used this project as the basis for a transdisciplinary art-led, eco art practice-theory inquiry, thinking that my PhD topic would however examine only one aspect of this project, my long love of nature film-making. However, gaining confidence as the work evolved and engaging in theory from Deep Ecology, Ecofeminism, Deep Green Theory, Ecocriticism, I began to realise that my project circled around a central key concern of how to relate to the forest in a deeply sustainable way for the long term. Or more, I kept looking at these disciplines to give me more insights to more deeply perceive and hence consider how I tend the forest. I have therefore begun to define more closely my emergent, transdisciplinary methodology that with the internet is enabling me to bring together recent insights from these disciplines that feed my question about how we might arrive at what I am calling ‘deep sustainability’ (as opposed to human-centred ‘sustainable development’). This I think may provide understandings that can be applied to other situations and would be useful for other practitioners. In 2011 Hollywood was listed on the new COFORD (Council for Forest Research and Development, Ireland) Low Impact Sivilculture Systems (LISS) database. At only 2.5 acres Hollywood is the smallest ‘Close-to-Nature’ continuous cover forest in Ireland. On May 11, 2013 I launched the Irish Green Party Forest policy with Jan Alexander and Chair of Carlow Kilkenny Green Party, Alan Price. It has as its key point, which I had argued for from my work, to move away from clearfell, monoculture plantations toward ‘Close-to-Nature’ continuous cover forestry. I worked with and managed the Green Party Forest policy group from 2010-12 and wrote the policy document that was composed of submissions from many forest stakeholders and leading forest advisors. I presented the policy in Dec 2011 at the end of the UN International Year of the Forest and it was fully adopted by the Green Party of Ireland and Northern Ireland in March 2012. The policy was the result of a committed group of people, who surveyed Irish forest stakeholders, NGOs; others liaised with forest groups and international and national forest advisors. I never imagined the time needed in getting policy work done! I had a comment from ecoartscotland research fellow Chris Fremantle that US pioneer ecoartists Helen Mayer Harrison and Newton Harrison would, ‘we are sure, endorse this – it’s the sort of Policy that they were proposing in amongst other works, the Serpentine Lattice’ (some of policy suggestions from this project ended up at the US White House). 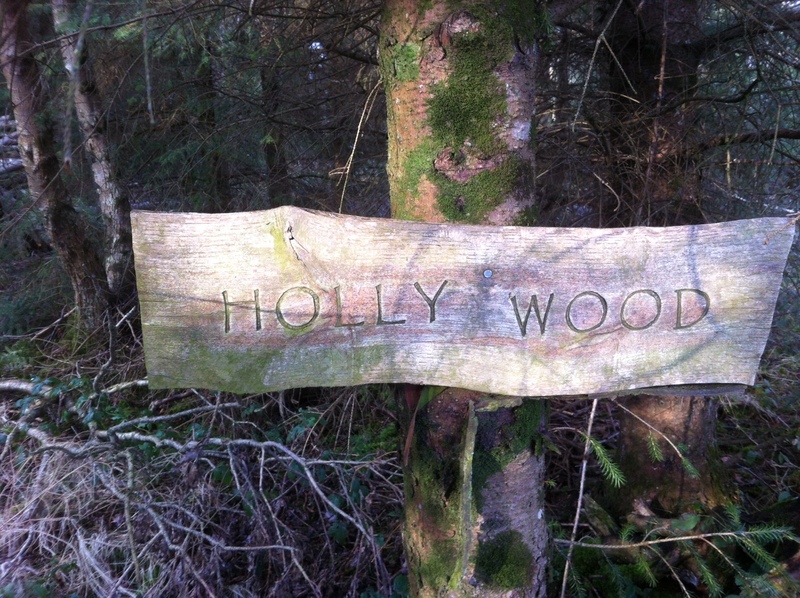 Hollywood project is official – it was added to the new local map of Carlow’s Blackstairs mountains and area! I had added the Hollywood conifer transformation project to Google maps some years and was really surprised when a neighbour emailed excitedly to say Hollywood is on the map (its named on the crossroads on the map) – so the project (and Holly) has an unexpected legacy – Holly was delighted. On 13 April 2013, I proposed a political motion, which was unanimously accepted by the Green Party of Ireland and Northern Ireland, to end corporate ecocide. Ecocide is a key term in my doctoral work and I see industrial forestry methods over the long term leading to ecocide: gross soil infertility, poor biological resilience and ecological destruction (European research has shown that within 3-4 rotations on monoculture-clearfell and replant forestry, that soil fertility is exhausted leading to uneconomic productivity). During the Vietnam war ‘ecocide’ was established as a legal term to describe long term environmental destruction from chemical agents that were used to destroy Vietnam’s forests. I am also a child of a former Vietnam veteran so I very interested in ecocide as my late father was fatally affected by Agent Orange. I’m particularly concerned how ecocide continues to thread through our everyday lives and in many of the industrial land practices we employ. After the motion was adopted I received a message from former NZ Prime Minister, now Head of UNEP, Helen Clark, congratulating me on the success of this motion. Her Labour government in 2008 arranged redress for NZ veteran’s and their children. This part of my practice is an attempt to get my key terms from my doctoral work more widely understood in the public domain, to begin social change toward our environments. Hollywood was assessed for the first time in January 2013 by professional foresters and is contributing knowledge toward new forest research and an upcoming forest science journal publication by COFORD (Council for Forest Research and Development, Ireland) researchers. The Hollywood Diaries forest art project was selected for inclusion in Joanna Macy’s inspired book, Stories from the Great Turning for the Great Turning Artful Chapter. Joanna Macy, now in her 80s is a leading Deep Ecologist/activist, educator and scholar. I attended the launch, showed my film in Bristol 17 April 2013; and the book has been since launched in Sydney (by Deep Ecologist John Seed) London, Oxford, Manchester and elsewhere.